Sonic and visual mayhem on a BIG scale to match the BIG beat anarchy and sounds of the Prodigy, the UK’s favourite genre defying electro anarchists who could just as easily impress an auditorium of metalhedz as they could a warehouse of crazy ravers – that was the goal for lighting designer Tim Fawkes! Tim has worked for Prodigy since 2012 and been their lighting designer for the last year. 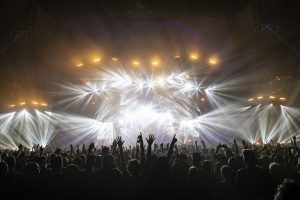 He’s currently fully embroiled in creating a lighting riot for the current “No Tourists”, tour promoting the Prodigy’s seventh album which just dropped and immediately blasted straight to number one – like the previous six! 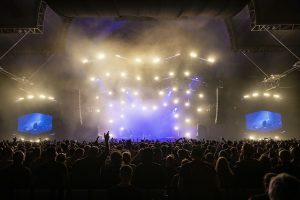 HSL is again the lighting supplier, and the band are playing arenas and living up to their reputation for being among the most exciting and full-on live acts on the planet since Liam Howlett, Keith Flint and Maxim first burst onto the scene in 1990. Tim went for a massive, wide and “epic” look for the stage. “I wanted to get away from the postage stamp look of some shows in arenas, where only a tiny part of the actual venue is involved” he explained. 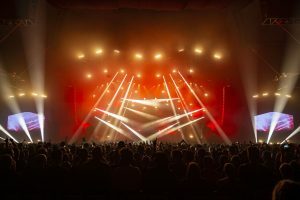 In addition to feeling the energy and atmospherics of the lighting, the band wanted to embrace the whole audience and pull them kicking and screaming into the Prodigy live trip and lighting plays an absolutely instrumental part in this process. 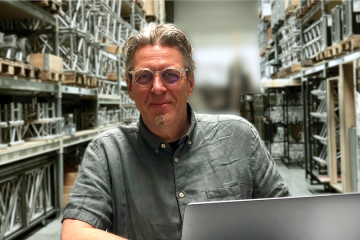 Tim was also involved in drawing up and developing the set design which is based on an idea from the band inspired by the album artwork involving the iconic Routemaster London bus. In the middle of the stage are two AEC Routemaster front-engined double-decker buses which are 6 metres high, 2.5 wide and 3 metres deep. Built by Brilliant Stages Tim worked alongside Prodigy production manager Tyrone Brunton and Brilliant account handler Bullet to perfect the scenic Elements As this is a Prodigy show, these are no ordinary London buses – Tim calculated how many lights he could squeeze into the space and filled them with Martin MAC Quantum Washes, Atomic LED strobes and ColorBlock II LED battens to illuminate the scrolling signs on the front, with Cob FC LEDs for the headlights. 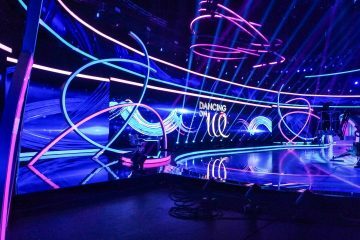 ‘Brickwork’ panels link the stage to the wings each side, so the space is connected and conjoined rather than having a gap, and these scenics, lit with Chauvet SIXPAR 200IPs, also conveniently work as a shield for monitor world and other technical areas. The zig zagged trussing over the stage and wings is based on the apex roof architecture of typical London Bus Depots. The overhead rig is designed to be as much of a retinal onslaught as possible to match the SPLs and intense sub-base characteristic of FOH engineer Jon Burton’s mix. The four main 20 metre LX trusses above the stage are all lined with Martin Sceptron LED battens … and there’s a total of 136 of these on the rig. 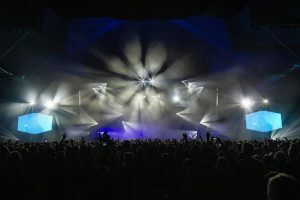 The main ‘general’ lighting fixtures are 58 x Robe Pointes – their multifunctionality effectively tripling the available lights on the rig – 62 x Atomic LEDs and 32 x GLP JDC1 strobes making a total of 98 strobes, 42 x 2-lites, 16 x 4-lites plus the16 x Robe MegaPointes which are on the moving pods (see below). 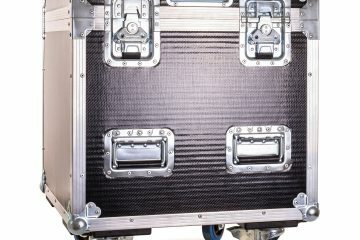 There are also 33 x Robe LEDBeam 100s which follow the curve of the band’s backline risers including the two on / off ramps. 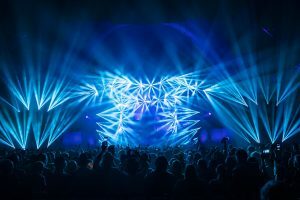 Fourteen Vari*Lite 4000 Spots are divided between the stage – six at the back for silhouetting, and six downstage for key lighting, with the other two at FOH for gobo projections during the intro. The wing trusses are 6 metres in width and angled to form alternating angled up / down diamond style lines / apexes. 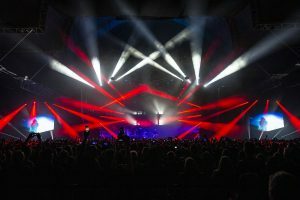 Over the stage there are four x 4-metre sections of truss each suspended on two 500Kg Liftket motors running with Kinesys Elevation 1+ vari-speed units which add some more upstage madness, positioned between LX trusses 3 and 4, operated by Steve Major using a Vector system stationed on stage right … with a spotter positioned on stage left. These pod trusses are also lined with Sceptrons and each loaded with four Robe MegaPointes, five JDC1 strobes, five old skool PAR CP60s and four active Sunstrips, all adding to the maelstrom of lightsources and visual options for Tim’s show, which is full tilt from the first to the last chord of the set! The set list is always changing every night to keep the returning fans happy, so the pod movements vary each night depending on what’s being played. When in their home (up) position they add to the zig-zagged lines of the roof. To add another raw touch to the environment, six PATT 2013 ‘big dish’ reflector lights on drop arms loom over the stage like giant industrial pendants. As you’d expect … there is some serious atmospherics to ensure that all these lights look super cool at every touch of the flash-buttons, delivered by five of HSL’s HazeBase Touring smoke machines Tim programmed and is running the show on a Whole Hog Full Boar console with another running as hot backup. He runs everything live illustrating his superlative timing and familiarity with the music. His fantastic team on the road are crew chief Matt Brown who is joined by Joe Dowling, Stu Wright, Ryan Soave and the aforementioned Steve Major. The tour is being account managed for HSL by Jordan Hanson assisted by Emma Turner. Jordan comments, “It’s always a pleasure to work with Tim, Tyrone and the rest of the Prodigy team. I look forward every time the tour comes back around! The design is massive and really suits The Prodigy perfectly. 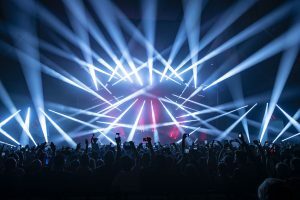 Amazing show and amazing people!” Building the set each day – working closely with the lighting crew – are set carpenters Ray Wheelan and Graham Kersley … and helping to make shed piles of noise havoc each night … are Jon Burton at FOH and Tom Maddox on Monitors.